The phylogenetic interrelationships of the modern species indicate that the Falconidae, which today have a worldwide distribution, originated in South America (Griffiths 1999). For this reason and because some molecular analyses provide support for a clade including the Cariamidae, Falconidae, Psittaciformes, and Passeriformes (Ericson et al. 2006; Hackett et al. 2008), it is tempting to speculate about possible affinities to the raptorial Phorusrhacidae, which are stem group representatives of the Cariamidae (Sect. 13.1; see also p. 108 in Olson 1985). (Fig. 14.1). This specimen is more similar to extant Falconidae, but is also too fragmentary for a reliable identification. 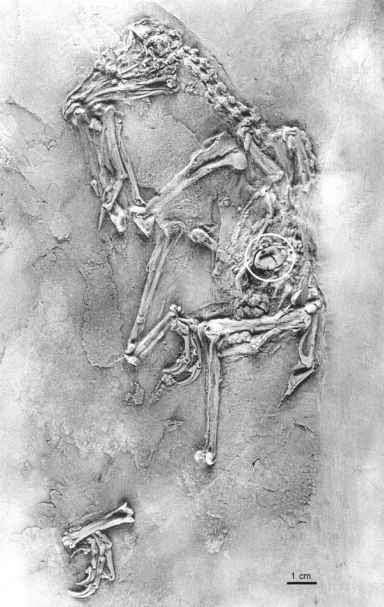 Mourer-Chauvire (2006) mentioned the presence of still undescribed Falconidae in the late Eocene and early Oligocene of the Quercy fissure fillings. A distal tarsometatarsus from the middle Eocene of the La Meseta Formation of Seymour Island (Antarctica) was assigned to the Falconidae by Tambussi et al. (1995) and Tambussi and Acosta Hospitaleche (2007). This fossil comes from a species that was the size of the extant Crested Caracara (Caracara plan-cus), to which it was also considered morphologically similar. 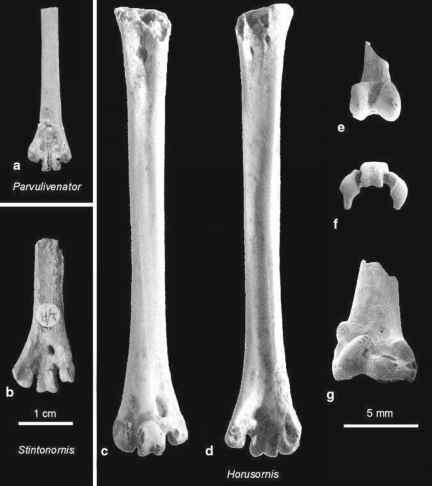 At least judging from the published figure (Tambussi and Acosta Hospitaleche 2007), however, the trochlea for the second toe does not reach as far distally as in extant Falconidae, and additional skeletal elements are needed to confirm identification of the specimen.